Take advantage of the latest in Christmas bulb technology. These fantastic blue bulbs have Surface Mount Designed LEDs and are dimmable. Blue is perfect for all the fans of the icy look for Christmas - one of our personal favorites. And who doesn't immediately think of Elvis singing, "I'll have a blue Christmas without you..." Well, maybe that's just us. The rich glow of these faceted C9 bulbs will deck your halls with a wintry freshness. Use blue as a solo color or combine with clear for a frosty, winter wonderland. White trees are especially beautiful when draped with blue Christmas lights. Add silver ornaments and you have a tree that any Dallas Cowboys fan will love to show off. Another fun option for blue C9 bulbs involves summer nights, BBQ and your pool. Welcome your guests with luxury by stringing these lights around your patio, gazebo, and landscaping. 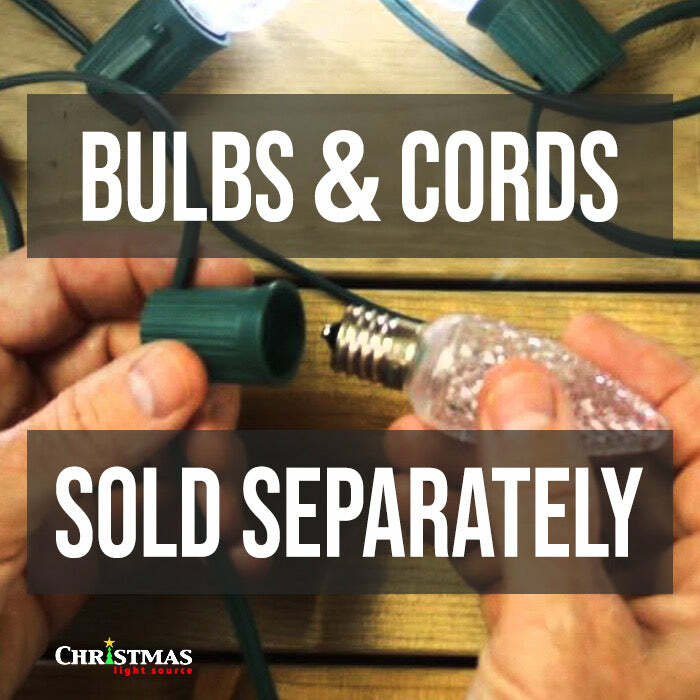 Be sure to look at our many varieties of hardware, which make installing your Christmas lights much easier. These lights are perfect! The bright, vibrant blue is beautiful. I always wanted to do a custom design for the house, glad I chose this place to do it with. Excellent customer service and advice. My family and I love the lights! These are very high quality LED lights! The faceted plastic that cover the 5 internal LEDs is durable and strong. This color is bright and beautiful. I have these lights paired with White falling Icicle lights and they look very nice! I wish they were less expensive. However, I considered this Christmas light project an investment in beauty that I have no doubt will give many years of reliable service. The neighbors all want to know where I bought my amazing Christmas lights. WE LOVE OUR LIGHTS! THE DELIVERY WAS PROMPT AND WE GOT THEM UP AND RUNNING THE DAY THEY WERE DELIVERED! THE ORDERING PROCESS WAS EASY AND FAST AND THE BULBS WERE JUST WHAT WE EXPECTED. THANKS! !